This is a very simple concept, made woefully complex. I wanted to make a chocolate negroni using Marou chocolate – a Marouni, if you will. It wouldn’t be the first one of course, but I reckoned I could make it better. Turns out it’s not so easy to get the balance just right and it took quite a number of trials (and errors) before I came up with a combination that satisfied. After that followed a series of incremental improvements to take it to the next level. The first attempt used the classic negroni mix of gin, Campari and sweet vermouth which were combined with cacao nibs from my friends at Marou and thrown into a water bath temperature controlled by my faithful Nomiku immersion circulator (you can get $50 off the Classic Nomiku via the link by using the discount code moodtherapist). This technique lets the ingredients mingle and hang out and works for all sorts of things from raspberry infused gin for deliciously fruity G&Ts to flavourful syrups such as spiced fig or coriander seed (with a hint of chilli), that transform an Old Fashioned into something spectacular. But this time it wasn’t a winner…the Campari was too bitter and the heat, even as gentle as it was, brought out additional bitterness inherent in unprocessed cacao. It was drinkable and actually it was pretty good but I knew that it was for a niche audience who like their drinks on the bitter side and this attempt was not going to be an accessible crowd pleaser. It took another week and numerous attempts before I hit on the final recipe which utilised not one, not two but three techniques but was several worlds apart. This is good. This time i swapped out the Campari for Aperol. It’s sweeter and less bitter and I thought the orange notes should work well with the chocolate. The first technique applied was pressure-infusion, using nitrous oxide to force the negroni mixture into the cacao nibs. When the pressure is released quickly, the gas expands, tearing apart the cell walls and releasing the chocolatey goodness back into the surrounding liquid. This method, developed by Dave Arnold, is fast and gives a rich flavour without the bitterness of the heated version. It tasted good – the flavour of the cacao was clear with the sweetness of the aperol and vermouth transforming it into a rich chocolate undertone while the bitterness you want with a good negroni persisted. I suddenly remembered how the use of a water bath, as I originally intended but had forgotten after so many attempts, not only helps for infusion of new flavours, but also helps to bind the separate elements of a drink – a kind of speeded up aging process if you will. With nothing to lose, I kept back a small batch for the sake of side-by-side comparison and put the rest into the temperature controlled bath for a long overnight soak. The difference was remarkable. Not only was it much smoother still and more rounded (even velvety) but the chocolate now seemed considerably more intense. I love the Marouni. 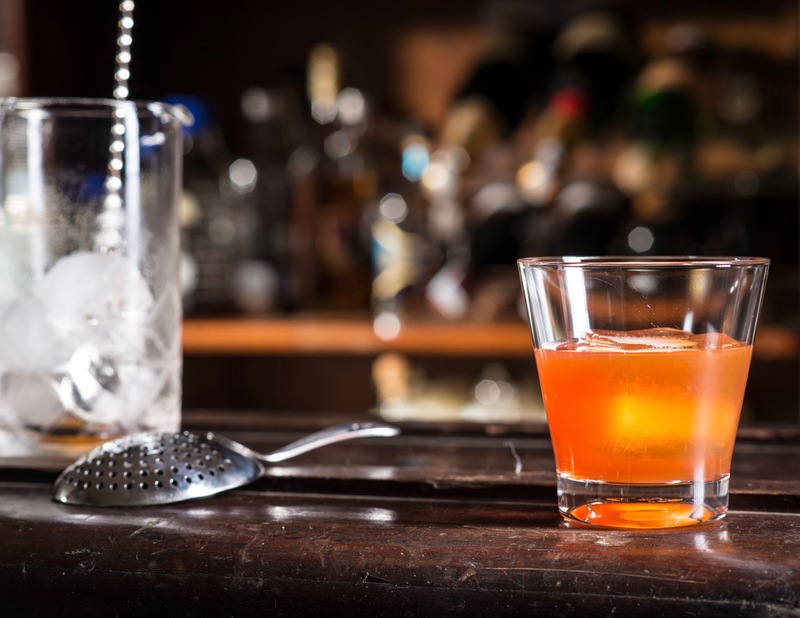 It will please a negroni stalwart but is also a potential gateway cocktail for those who find the original too intense to handle. Many thanks to Matthew Dakin for the great photo.